Hello! We have a restaurant bar in Ikebukuro, Tokyo. Our bar's original thene is "having a large pool where 4 penguins live"! It is the only one in Tokyo! They are 2 pairs. They swim and walk in their large living space. You can feed them ( food provided by us) at some time. Of course, we provide a lot of drinks and an original food menu. 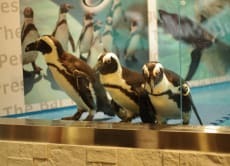 Please enjoy eating, drinking, playing with our penguins! We're looking forward to your reservation! See Penguins in a bar at Ikebukuro, Tokyo! The staff at The Penguin Bar was awesome. We bought a package through Voyagin and were treated to a VIP experience. We were seated in the best seats next to the penguin tank and a nice flow of sake along with a four course meal. The staff was really attentive and noticed that I was a picky vegetarian and brought an extra pizza without my asking which I was super grateful for. The bar was very similar to a greenwich village spot and one of the more American like bars that we visited in all of Tokyo. As the door says this is a bar at which Penguins are present. The penguins laid an egg at the time so there wasn't the opportunity to feed / interact with them. The food was just okay. Highlight of my trip, food leaves a little to be desired; however, you are not here for the food right!! !